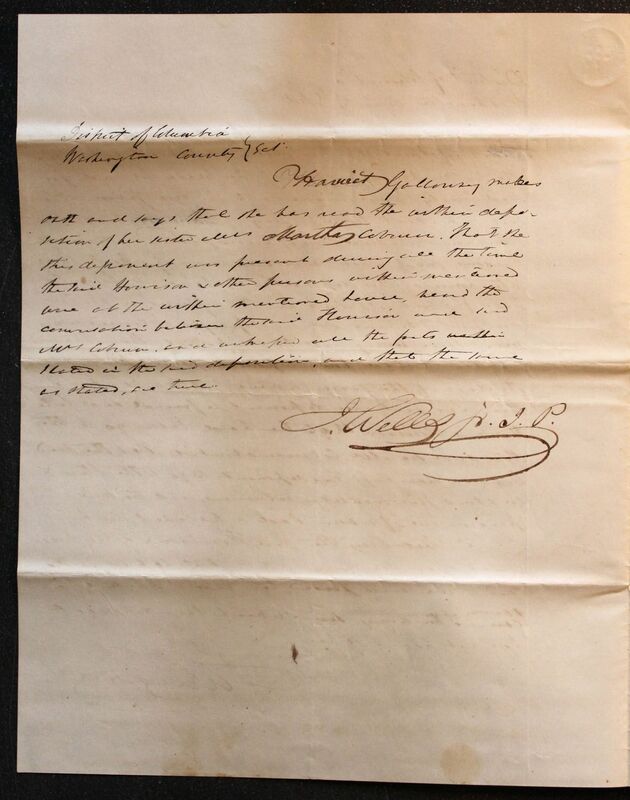 Mrs Martha Coburn on this third day of April 1835 personally appeared before me, the subscriber, a justice of the peace in and for said County and made oath in due form of law. That on or about the 26th day of January last Henry Howison of the said County accompanied by three other persons one of whom was the driver of a hack, came to the house of this deponent's husband (Mr John Coburn) about 4 'o'clock in the afternoon for the purpose of taking one Ami Grey, a coloured woman then living with this deponent. That the said Howison asked this deponents permission to break the door of the room where the said Ami then was, but this deponent refused and told the said Howison that he had better go to the store and see Mr Coburn about it. That the said Howison then left this deponent to go to the store & in about five minutes returned with the said other persons, one of whom had a hatchet in his hand. That they the said Howison & other person forced open the door with the hatchet, seized the said Ami and forced her into a hack and carried her away. Since which the deponent has not heard of her. J. 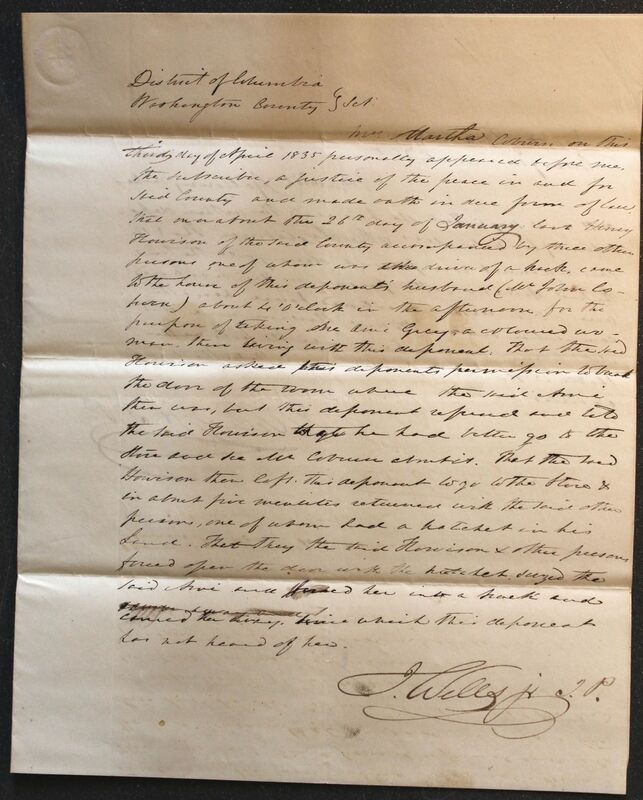 Wells Jr J. P.
Harriet Galloway makes oath and says that she has read the within deposition of her sister Mrs Martha Coburn. That she this deponent was present during all the time the said Howison & other persons within mentioned were at the within mentioned house, heard the communication between the said Howison and said Mrs Coburn and witnessed all the parts within stated in the said deposition. And that the [illegible] as stated, are true. J. 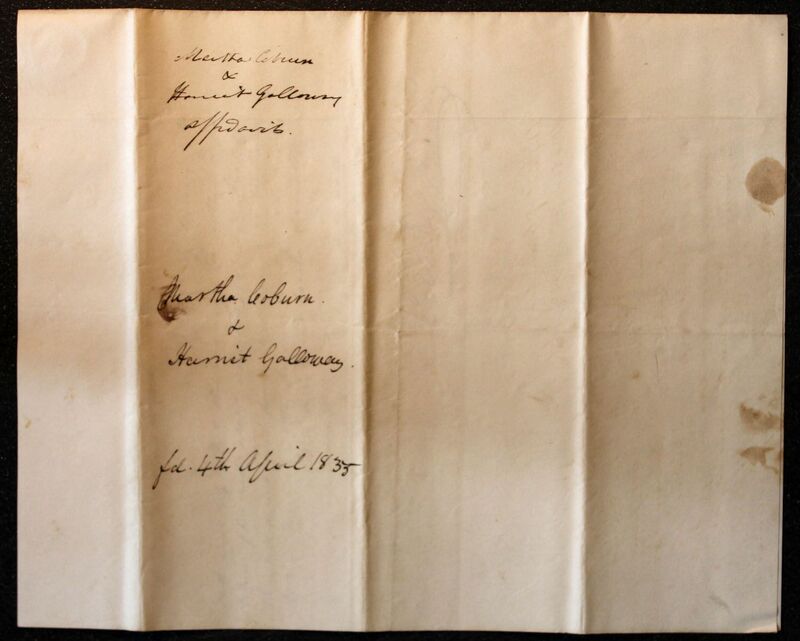 Wells jr. J. P.
Martha Coburn & Harriet Galloway Affidavits.